Adam Larter is a comedian, writer and founder of Weirdos Comedy Club. Adam started performing comedy whilst a student of Creative Writing at Kingston University and has since performed four shows at the Edinburgh Festival whilst also growing a critically acclaimed and award nominated Comedy Club that showcases some of the best acts in the alternative comedy scene. 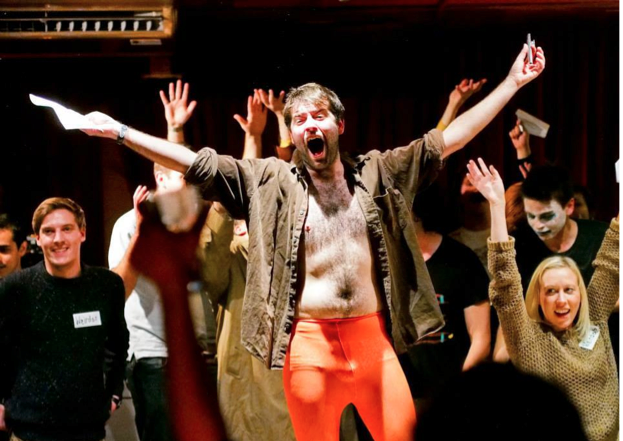 Adam directed the Weirdos production of ‘Hook’ in 2012 at Bethnal Green Working Men’s Club which raised over £4000 for Great Ormond Street Hospital. The production also received a nomination in 2013 for the Chortle Award for Innovation. Adam has co-written and co-directed another anarchic comedy pantomime with Matthew Highton called ‘The Colonel’. The story explores how a poor boy from Kentucky becomes a face seen on every high street. Featuring some of the best alternative and award-winning comedians including John Kearns, Ben Target, Pat Cahill, Beth Vyse, Joz Norris, Marny Godden, Karl Schultz and Ali Brice. All money raised goes to Great Ormond Street Hospital. Sara Shulman is the Founder and Editor of Comedy Blogedy, TEDxUCL speaker on ‘The Power of Funny’, former Head of Comedy at UCLU Rare FM and produces the Humour Me Comedy Podcast. Sara is also a recent graduate of Classics at UCL and occasionally gigs on the comedy circuit.